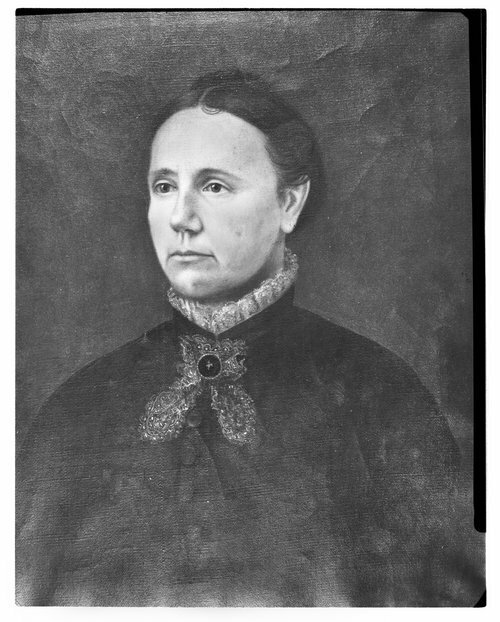 This black and white photograph shows a painting of Maria Dotts Wilson, (1832-1908). Born on January 21, 1832, to Thomas Benton Dotts and Delilah Kendall Dotts, in Stark County, Ohio. Maria later moved with her parents, in 1832, to Tuscarawas County, Ohio where she meet and later married, on March 21, 1850, Vear Porter Wilson. In 1870, she accompanied her husband and a group of settlers know as "The Buckeye Colony" from Tuscarawa County, Ohio to Dickinson County, Kansas. Maria and her family eventually settled in the town's county seat of Abilene, Kansas. As a wife and mother she shared in the success, the failures, the joys and the sorrows that were bestowed upon the family. On December 8, 1908, Maria Dotts Wilson passed away at the age of seventy-six at her daughter Margaret Humbargar's home in Aberdeen, Washington. She was later buried at the Abilene Cemetery in Abilene, Kansas.